Jay Smith’s claims during his debate with Dr. Shabir about the Qur’an have seemed to cause more trouble than he initially thought they would. 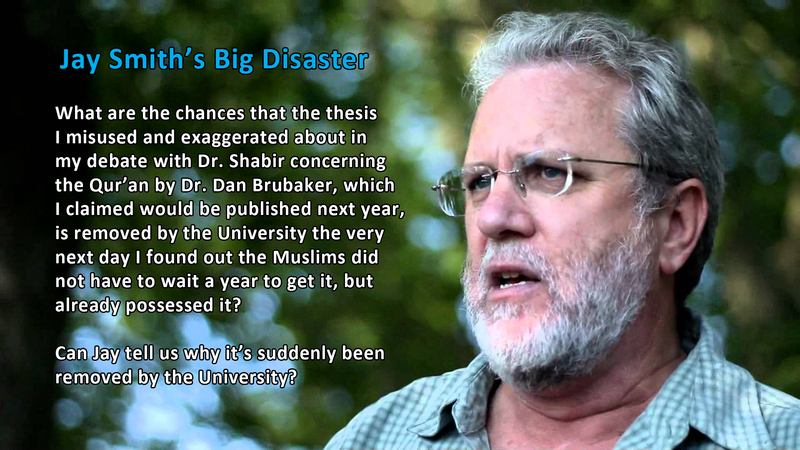 See, during the debate, he claimed to have introduced new research by a colleague of his, Dan Brubaker, based on Dan’s thesis on changes in the (manuscripts of the) Qur’an. Jay had stated that Dan’s thesis would not be published until next year and so Muslims would not have been aware of its contents. However, the University that Dan Brubaker submitted his thesis through, Rice University, made his thesis available publicly. Jay, nor Dan seemed to have known this, which is why Jay assumed Muslims would have to wait one full year before they would be able to read Dan’s thesis and respond to the claims in it. Which also meant Muslims would have to wait one full year to respond to Jay’s claims based on Dan’s thesis which he made during the debate. Why was the thesis removed after my article was published? Did Jay ask Dan to ask the University to remove it? Why would Dan suddenly request for the University to remove the thesis? Dan did not request the University to remove the thesis after the debate, so why the day after my article? Did Dan give Jay the entire thesis or just a few photos? If Dan did give Jay the entire thesis, why did Jay only claim to have taken a few photos? If Jay did read Dan’s thesis, is he aware that he openly contradicts what Dan states? Is Dan aware that Jay claimed things of Dan’s thesis that do not exist within it? Why has the University removed the thesis? Who requested the thesis be removed? This article has been sent to Jay Smith. Will he respond to the questions, or does he realise he’s in a bit of a conundrum? Has Jay been put in an awkward position? Its sudden removal is quite telling. Jay does have reason to be concerned, why else would it be removed? Why else would Jay have Dan request the University to remove it? Jay knows that he’s screwed up big time and the fun is only just starting! If you have the thesis, why don’t you make it available for download ? If you’re willing to pay the lawyer’s fees for breaking the University’s copyright of the thesis, kindly send it using the donation button on the website. Once I receive the money from you, I will gladly post it. Your saying there is a copyright on a document that was posting online to be freely downloaded? On a site that lists several other thesis papers for the very same purpose? Somehow I doubt that there is such a copyright and even if there were Rice Universities willingness to post the document online for anyone to download negates any claim to copyright. Also you could just email it to who ever requests it thereby not publishing it but merely sharing it with others who ask. So how about it? Care to email me a copy of the thesis? I would enjoy reading it fully.